FILLING BLANK SPACES: SPECIAL ANNOUNCEMENT: SUPER SWINGIN' HERO 1968 SPECIAL NOW AVAILABLE! 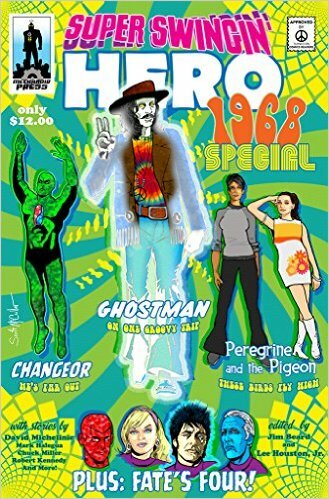 SPECIAL ANNOUNCEMENT: SUPER SWINGIN' HERO 1968 SPECIAL NOW AVAILABLE! Okay folks, I didn't find out about this until earlier, but here's a ray of sunshine to brighten your day! The Super Swingin' Hero 1968 Special has just been released for the Kindle by Mechanoid Press, with the print version soon to follow. This anthology was a labor of love over most of the Spring as I helped Jazzy Jim Beard assemble an all star cast of authors to create some of the most outlandish send-ups in all of comicdom in one kooky collection of heroes straight from the flip side. Thrill to the afterlife adventures of Ghostman by comics legend David Michelinie! Hang out with Beauty and the Beetle as they solve a mystery of Lovecraftian proportions by Sam Gafford! Witness The Coming of Changeor by Erwin K. Roberts! Discover how The Crawler Creeps with Chuck Miller. Do you dare go adventuring with Fate's Four and Thomas Deja? Soar with The Peregrine and the Pigeon with Bonnie J. Sterling as your co-pilot. What enigmatic mystery has Mark Halegua created for the robot detectives of Automation Investigations, Inc.? Will Hathor's Gift be of any H.E.L.P.? Only Lisa Collins knows. And finally, your kooky co-editors get into the act! Jim presents the latest adventure of The Go-Go Gears and I reveal the outrageous origin of The Substandard Quintet! The sky’s the limit for these Swingin’ Heroes in a pulse pounding collection of superhero prose fiction unlike anything you’ve ever seen before! The wait is over Mechanoid Mavens! You can get you Kindle copy now at AMAZON, and the print copy soon!